The game was played in front of a partisan crowd who created a great atmosphere throughout the game. Match-ups would be key in this head-to-head and it was ARU's season leader, Nadege Talva who opened the account for the home team, scoring four early points. TSK's scoring leader, Geena Gomez responded with a jump-shot from midrange. As the game turned into a heavyweight boxing match, shot attempts glanced the rim and passes and drives were parried and blocked by opposition defence. However, it was Italian guard, Zaffroni who would break the tie, coming off the bench to score 7-first quarter points and give ARU a 7-point lead going into the 2nd period, 24-17. TSK hit back first in the second period, with Captain, Earleesha Jackson, attacking the basket and getting fouled in the process, converting both free-throws from the charity stripe. Then TSK's sharp shooting Estonian hit-woman, Kristina Karpova, hit a three-ball to bring the score within three. Once again the two teams began trading baskets, but it was consecutive baskets from veteran, Stevie Ellis, that gave TSK their first lead of the contest (34-32) midway through the period. But it was ARU that finished the quarter strongest, with Zaffaroni hitting two consecutive jump-shots to end the half with a narrow 3-point lead, 42-39. Despite the two and fro nature of the first half, the third quarter saw ARU go on the offensive, whilst TSK looked bewildered and lacking energy. The quarter seemed to be following the script in the early stages with both teams trading early offensive bombs. However, after roughly two-minutes of play ARU would go on a 17-3 run, during which TSK turned over the ball and struggled to create quality possessions. All three of TSK's points came from the free-throw line. After ARU's Hulme made a lay-up from a nice piece of one-on-one skill, the home team had amassed a 19-point lead. A late fight-back in the closing minutes reduced the deficit to 14, before ARU's No.5, Gonzalez Palacios, hit a timely 3-point bomb to end the quarter, 67-50. TSK regained their fighting spirit in the fourth and would get within 8-points with 4:43 remaining. However, ARU held their nerve and systematically made key plays, stretching their lead to 16, before closing out the quarter with a 10-point cushion. Final score, 86-76. After 1st-seeded, Bristol Flyers, fell to 5th seed, Reading Rockets, earlier in the day, ARU would make it their second successive trip to the Playoff Finals. Whilst TSK had the stronger seeding going into the quarterfinal match-up with Ipswich, Ipswich were one of only two teams to take both regular season games against third placed TSK. The home team were keen to learn from previous performances and would need to put on a stellar performance to overcome one of the league’s strongest backcourt duos in the form of Harriet Welham and Esther Little. The game started well with Chiara Di Stefano scoring from mid range, followed by a 3-point bomb from Geena Gomez. Ipswich responded with a lay-up from Welham, before TSK exploded with a 10-2 run. The starters were assisted by contributions from Sonia Awour and Kristina Karpova, to close out the first period. Welham, Little and Taylor-Willis all made baskets for Ipswich, but it was TSK who would finish the quarter strong, 31-15 ahead. Ipswich’s offence got going in the second quarter paced by the trio of Welham, Little and Redhead. A 6-2 run got the visitors back into rhythm before Awour and Di Stefano hit consecutive baskets. Ipswich stayed in the game thanks to the play of Welham who attacked from the inside. Meanwhile, Taylor-Willis kept TSK’s honest from the perimeter. Nevertheless, TSK maintained a 13-point advantage at the break, leading the game 50-37. The third quarter did not disappoint as both teams stepped up intensity at both ends. Ipswich continued to pressure in the full court, turning TSK over a couple of times. However, Ipswich could not find a way to stop TSK’s balanced attack. Kristina Velkey who was just one rebound short of a double-double in addition to 7-assists, plagued the Ipswich defence with her penetration, mid-range and long-range game. Andrea Kurkowski, who would finish the game with 17-points and 7-rebounds created several match-up problems for the visitors. TSK closed out the quarter with basket’s from Sneddon and Kurkowski to take a 19-point lead into the last stanza. Taylor-Willis was not done in the fourth, hitting big shots from the outside in an attempt to limit the damage, but in spite of her heroics, the inside pairing of Kurkowski and Jackson kept TSK’s offence rolling. Defensively the home team contested shots and deflected passes, creating some fast break opportunities mid-way through the quarter. Whilst Ipswich were able to close the gap to 18-points in the half, this was closest they would get to upsetting a home victory. The game ended 89-70, which sees TSK progress to the next round and a semi-final match-up away to 2nd seed, Anglia Ruskin University. Team Solent Kestrels were back on the road after a three game home stretch. Southwark’s youthful and indomitable challenge kept the game close at the end, but a solid early performance meant that TSK were always in the driving seat. The starting five saw the return to a familiar line-up with Gomez supported in the back-court by Krisztina Velkey and Solent University student, Chiara Di Stefano. The game stated with both teams trading baskets. Kurkowski got Solent’s tally off the mark with a lay-up before the Pride responded quickly in transition. Gomez got going early scoring eight first-quarter points. Senior player, Watkins helped to stem any serious deficits for Southwark with two baskets in succession, to take a 14-12 lead with a couple of minutes to go, yet despite some turnovers by TSK baskets from Cante and Eliis gave Solent a 2-point lead at the end of the first, 14-16. The second quarter would prove to be decisive. Jodi Jerram came out rejuvenated, hitting four 3-pointers in succession, which sparked a 16-0 run. Southwark tried to respond through Sandie, who got to the line and made one from two. However, Solent’s defensive effort restricted the London side to just 7-points, whilst Solent scored 21. TSK went into the half with a solid 16-point buffer. TSK remained solid in the third with despite some resistance from the Pride’s defence. Once again TSK’s bench showed up at both ends, with Elosie Sneddon scoring successive three’s to extend the lead to 20-points. Gomez continued her good shooting form, burying points from the foul line and the perimeter. A blanched attack of inside-outside ball, put pressure on Southwark’s defence, whilst thy struggled to find any consistent rhythm on offence. TSK would outscore the home team by a further 7-points, stretching the lead to as much as 25-points and finishing the quarter 31-54 ahead. However, TSK’s offensive production disappeared in a final quarter, which would see them put only 9-points on the board. Conversely, seemingly with nothing to lose, Southwark mounted an all out defensive assault which put Solent on the back foot and would all but distinguish their advantage. Whilst Southwark finished the game stronger, it was too little too late and TSK sealed an important road-win, 53-63. In the second of two games this past weekend, second place TSK took on league leaders, Bristol Flyers. Flyers have the best record in the league having only dropped two games all season. TSK were 9 and 3 going into the contest, having beaten second place Anglia Ruskin the day before. Flyers were also involved the previous day, having had a close one against bottom of the table, Reading Rockets. TSK hit first in the second through Cante and Otieno, before Flyers replied with a strong move to the basket from Centini McDonald. Flyers leading scorer, Cristina Bigica, would get things going early, getting to the foul line on consecutive trips and proving deadly accurate from the stripe. Not to be outdone, TSK season points leader, Gomez, got into the action getting to the line and making shots from the perimeter and midrange. However, the two teams could not create any real separation, and TSK took a 4-point lead going into the second half, 46-42. The third-quarter looked reminiscent of a heavy weight boxing match with neither team able to make any real ground. However, whilst TSK would hold Bristol to just 12-points in the quarter, an uninspired offensive performance left the Solent team with just 6-points. Captain, Earleesha Jackson scored all 6-points for TSK in a quarter marred by indecisiveness, turnovers and missed opportunities. The quarter ended 52-54 to leave both teams with everything to play for in the final quarter. Bristol entered the fourth with the greater sense of urgency and initiative in the fourth. Wallace attacked the hoop on consecutive trips with no help in sight from the TSK defence. Gomez got to the line and buried both , followed by Karpova hitting a mid-range jumper to bring the teams within two. However, TSK couldn’t grab a lead as Cristina Bigica hit 4-points in succession. Gomez score two-consecutive baskets to bring the game with two for the second time. The home crowd were on their feet, willing TSK to find a way through, but a late foul against the home team, followed by technical free-throw, put pay and any opportunity for a last minute reprieve. Bristol Flyers closed out the game and left winners, 66-72. 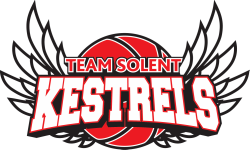 Team Solent Kestrels faced a tough challenge this weekend facing-off with no. 2 placed team, Anglia Ruskin on Saturday 16th February, followed by no. 1 placed team, Bristol Academy Flyers, the following day. Anglia came out with the greater sense of purpose in the second period, going on a 2-12 run and opening up a 10-point lead. TSK got their outside game going with 3-point bombs first from Jodi Jerram, then Krissy Karpova. TSK would eventually claw back the score, reducing the deficit to just 3-points with 1.17 to go, before committing a foul, sending Anlia’s third top scorer, Hulme to the line. Hulme would sink both before hitting another 3-point shot, extending their lead to 4-points and ending the first half, 35-39. TSK regrouped during the break and seemingly supercharged their defensive effort. Gomez got things going with a 3-point bomb to start the quarter, followed a quick lay-up to the hoop. Kurkowski got fouled at the line, making both. Gomez and Ellis worked together togged another 4-points before Anglia’s Zaffroni scored their only basket of the quarter at the 4:35 mark. Gomez would pace all scorers with 14-points in the period, whilst Ellis scored 5-points, an rebound, an assist and a block for a rounded contributed to TSK’s 24-point effort. The quarter ended with TSK leading, 60-41. In a seemingly bizarre reversal of fate, it was TSK who struggled to find the basket in the final stanza of the game. TSK would be scoreless for the 4-minutes, breaking their seal on the basket through a Karpova jump-shot. Moments later TSK’s Captain, Earleesha Jackson would score again, but no other TSK player would find the hoop for the remainder of the contest. In the meantime, Anglia regained their confidence and composure, pouring in 21-points for the quarter. Fortunately for the hometown fans, Anglia’s ate charge wasn’t enough to extinguish the home’s team’s advantage and the game would finish with TSK leading by 3-points, 64-61. In the historic local rivalry between Team Solent Kestrels and Reading Rockets, TSK secured the first of two meetings between the teams. Having postponed the initial match-ups in November and January, TSK finally got a chance to measure themselves against the National Cup Runners-up. TSK stated their intentions early, establishing an early 10-6 lead midway through the first quarter. TSK first attacked on the inside with buckets from a below par [sick] Kurkowski and very efficient Jackson. Reading responded by attacking the paint through Noa Sanchez Marques and Reveron Herranz De Antonio. However, it was a composed TSK performance that would mark the first quarter, who’s defensive efforts held the Rockets scoreless for the last three-minutes of the period and securing a 7-point lead, 19-12. Reading struck first in the third with a close-range jumper from No.14, Maike Fasbender. The Kestrels replied with an outside bomb from Kristina Karpova, but after a further 2-points from Kurkowski to make the 42-41, this is the last time the Kestrels would lead in the third. Fasbender, Nunez and Antonio combined to spark an 0-8 run for the visiting Rockets. It was the Kestrel’s bench that came to the rescue with Karpova scoring 8 of her 11-points in the quarter. The quarter ended even at 54-54 all and everything to play for. The Kestrels started the fourth with a renewed sense of urgency at the defensive end, which sparked their transition game and a 10-4 run. Reading responded through Maria Gomez, who buried two at the foul line. But it was too little too late and the Kestrels went on another 10-2 run. Krizstina Velkey paced all scorers with a season-high 23-points, 10-rebounds and 9-assists. TSK scored first with a long-range bomb from behind the three-point line, before barking opened their account with a drive to the basket from No. 15 Annim. What followed was a bizarre 4-minutes in which neither team could hit a basket, until Eloise Sneddon hit another 3-pointer for the Kestrels, bringing the score to 6-3 after 5-minutes of play. Suddenly the Kestrels found some rhythm, hitting with impunity from the inside through Kurkowski and another outside shot from Sneddon. When Gomez got fouled and hit all three free-throws, the Kestrels had a 16-7 lead. Despite consecutive scores from No. 6 Sheaia, it was the Kestrels who dominated the first stanza of the game, finishing the quarter 23-14. However, the second period was a very different affair in which a low scoring quarter was dominated by Barking. Whilst Barking made adjustments at the defensive end, the Kestrels struggled to find the basket, often settling for early mid-range and perimeter jump-shots. Barking’s No.14, Pawalta, was the high-scorer for the period with 6-points. Despite their scoring woes, TSK finished the half with a 5-point lead, 30-25. In the third TSK remained passive on offence, despite an early points from Kestrels’s starting-centre, Earleesha Jackson, who would score six of her 18-points total in the quarter. However, a comprehensive defensive performance limited Barking to just 7-quarter points, subsequently stretching the Kestrels’ advantage to 13-points. After three relatively subdued quarters of basketball, the Kestrels came alive in the fourth. Andrea Kurkowski got things started with a close range jump-shot, quickly followed by Gomez, attacking the basket to extend the lead to 17-points. Barking’s Annim got fouled and hit one of two from the line, but the Kestrel’s shooting guard, Chiara Di Stefano, hit back with a contested jump-shot to make the lead 18-points. Di Stefano’s 9-points and 5 assists in the quarter might have been the story of the quarter, had Gomez not put on a show for her team and the fans. With 6-minutes to play, Gomez hit the first of four consecutive 3-pointers to pace all scorers and reach a game high 27-points for the game. When Di-Stefano stole the ball and made a buzzer beating lay-up to end the game, the Kestrels had scored 39-points fourth-quarter points in an upside down win, 84-44. Team Birmingham scored first with a jump-shot from Number 11, Cooper. However, the home team responded quickly, going on a 14-point run. Gomez got the home team started with four of the starters scoring, before Lucie Woellenstein came off the bench to make an immediate impact, giving TSK a 14-point lead. However, the combination of TBE’s Brindley and Cooper finished the quarter strong. The pair combined to score all fifteen of Birmingham’s first quarter points. The quarter ended, 20-15. The front-court combo of Jackson and Kurkowski punished the visitors on the inside, combining for the first six TSK points of the second period. After both Gomez and Jackson got to the line by the middle of the quarter, TSK were up by 13, but Rebecca Brindley’s 11- points for the quarter kept the visitors in contention, and cut the deficit to just 11-points at the half. The half-time score was 44-33. Whilst both teams struggled to find the basket in the early going, a 2-point bucket from Gomez broke the seal. Shooting-Guard, Eloise Sneddon hit a big 3-point bomb, followed by quick baskets from Andrea Kurkowski, Earla Jackson and another 3-pointer from Kristina Karpova. All in all, TSK went on a 13-point run and held a 20-point lead, before TBE scored a bucket from Salmon. Karpova would score 7-points in the quarter, whilst TBE could only manage 10-points combined. TSK took an almost unassailable 22-point lead to finish the period, 65-43. The final quarter saw the visitors finally find some offensive focus, sparked once again by Brindley who scored a further three of her game-high, 20-points. However, it was the home team that finished strongest with buckets from Curson, Jerram, Cante, Kurkowski, Karpova, Jackson and Velkey to close the period, 88-60. “Today was a very solid performance, particularly after a tough game yesterday. Everyone showed-up this weekend and played their role well. As a team I feel like we took a really positive step forwards in moving the ball and finding each other. At the defensive end we played together and made adjustments, so I’m looking forward to a productive practice this week and we should all be pleased with our production this weekend.” Commented Coach CJ Lee. Both teams came out firing with Krisztina Velkey getting off the mark first with a 2-point jump shot. Southwark responded quickly through Sarkodee-Adoo, but it was the Kestrels who looked the more focussed. In fact, all five starters scored in the period as Kestrels pushed the ball in transition and moved the ball with impunity, sparking a 16-4 run. Southwark regrouped and buckets from Sarkodee-Adoo, Sandie, Haines and Hyacienth got them to a total of 14 points for the quarter, but some superb 3-point shooting from Melanie Curson, who went 2 for 2 from behind the arc, gave the home team a 27-14 lead to end the first quarter. The second quarter was a much tighter affair with both teams making adjustments at the defensive end. Southwark jumped the pick and roll, which all but extinguished the Kestrels ball movement. The Kestrels defence also worked hard to limit Southwark to contested perimeter shooting. After 4-minutes of play each team had only scored 2-points. The quarter ending largely in a stalemate, with Southwark taking a minor advantage, eventually scoring 14-points, whilst the Kestrels could only manage twelve. Half-time score 39-28. In the third quarter the TSK re-found their rhythm on offence. The starting combo of Gomez and Velkey came out with renewed purpose, combing for twelve of the Kestrels seventeen quarter points. Southwark equally benefited from some inside scoring from Number 12, Watkins, whilst Sandie provided some much needed perimeter balance. TSK held onto a 14-point lead to finish the quarter, 56-42 ahead. Southwark are not a team to lie down and roll over and took their defensive intensity to another level in fourth. With 3:18 remaining the Kestrels still had a 12-point lead, when Velkey fouled Sandie, who obliged by hitting both free throws, then stealing the ball back on the inbounds and scoring another two. Earla Jackson scored a two at the other end, to put the home team back ahead by nine, but seven quick points from Southwark reduced that lead to just two, before Gomez’s assist to Jackson gave her another score to add to her 14 points and seal the win for the home team. Both teams came out firing with Anglia getting off the mark first with a 3-point bomb from Maddaloni. The Kestrels responded in-kind with points from Gomez, Velkey and Kurkowski. TSK would take a small lead midway in the quarter, but Anglia’s Number 4, Koutsourelaki, hit two big threes in the quarter keeping the home team in close contention. It was, however, Gomez who would hit a three of her own and a 2-point jump shot to close out the quarter, 21-20 to the Kestrels. In the second quarter both teams made adjustments at the defensive end and the game became a back and forth affair. ARU guard Nadege Talva scored 7 of her game high, 28 points, but this was off-set by TSK’s Centre, Earlesha Jackson, who scored 6-points in the quarter, ably assisted by contributions from Velkey and Gomez and topped off by a late 3- pointer from Kristina Karpova. Whilst the quarter had proffered 15-points for both teams, it was Ruskin that looked the more connected and fluid on offence. At the start of the second-half Anglia came out on fire and went on an 8-0 run, quickly extinguishing the Kestrels meagre half-time lead. Coach Lee, called a time-out and reminded his players to commit on the defensive end, whilst playing with more composure on offence. Anglia scored again through Talva, taking a 9-point lead before Krisztina Velkey restored balance with a strong drive to the basketball and got fouled, which resulted in a made basket and one. Geena Gomez followed suit, scoring a further 7 and sparking a 10-4 run in favour of the Kestrels, who ended the quarter, 51-49 ahead. Both teams played with determination in the final quarter. The Kestrels forced Anglia into several mistakes through their pressure. Not to be outdone Anglia’s number 15, Treadwell, came to to the hosts rescue, scoring 10-points in the quarter that not only kept them in contention, but ultimately turned the tide for the home team. Despite having several opportunities to close out the contest, the Kestrels fell short in the closest of fought match ups so far this year. Anglia Ruskin took the first of two meetings, 70-73. Team Solent Kestrels Women were back in action in the 2nd Round of the National Cup on Saturday 27th October 2018. A near 4-hour road trip almost resulted in an abandonment when the home team, Nottingham Trent University, couldn’t find their licence cards. Thanks to the combined efforts of the officials and our own Performance Analyst, Cliff Fullbrook, the pre- game drama was resolved just minutes before the 7:30pm tip-time and the game got underway. Both teams looked rusty in the early going, with several missed shots from close-range. The home team drew first blood with a made basket through Richardson. Kestrels Captain, Melanie Dell, levelled the score which settled the team with buckets from Earla Jackson, Andrea Kurkowski and Geena Gomez in quick succession, sparking a 20-5 run. However, it was the Nottingham outfit that finished the quarter the stronger, going on a 6-0 run to end the period, TSK up 22-13. The second quarter was a back and forth affair, with both teams showing a mixture of laxity and tenacity. Nottingham attacked the Kestrels defence on the interior, despite being the smaller team, Power Forward Musson created some serious match-up problems for the Kestrels, as they struggled to keep bodies between the opposing players and the basket. At the opposite end, the Kestrels continued their trade mark inside-out attack with points from Kristina Karpova, Jodi Jerram on the outside and Lucie Wöellenstein and Melanie Dell on the interior. The Kestrel’s weathered Nottingham’s fightback, extending their led by just 1-point. Half-time score, 36-26. Coach Lee’s half-time talk centred around focus and composure at the offensive end and urgency at the defensive end. The team responded in kind, holding the home team to 11 points, going on a 17-2 run and extinguishing any chances of a NTU comeback. The Kestrels bench provided some intensity at both ends of the floor with Karpova showing a return to form, after a week away from the team. End of the 3rd score, 59-37. In the final quarter, Nottingham continued to play with determination, but despite the heroic efforts of starting guard Gray, who scored almost half of the team’s total with 24 points, the home team could do little to reduce the deficit. Though they would score another 14-points in the 4th, the pressure of the Kestrel’s full-court pressure proved too much for the Nottingham team. When Chiara Di Stefano hit a jump-shot early in the quarter, nine of the Kestrel’s players had scored in a game which was all but over by the middle of the third quarter. Final score, 81-53. TSK will play host to Team Birmingham Elite at St. Mary’s Leisure Centre on Sunday 18th November 2018 in the Quarter Finals. Team Solent Kestrels Women were back at home on Saturday 20th Octobe 2018, playing host to the East Midlands based, Loughborough Student Riders. The Riders entered the game in great form, after beating Southwark Pride and Oxford Brookes in the early weeks of the season. The Kestrels were also coming into the game off the back of consecutive wins in the past couple of weeks. The game started at whirlwind pace with the Riders getting off the mark first with a jump- shot from Holly Wright, quickly followed by a mid-range bucket from Kestrel’s American guard, Geena Gomez. Kestrels continued to attack the hoop with baskets from Krisztina Velkey and Gomez, whilst Eloise Sneddon kept the Riders’ defence honest by scoring from the outside. The Kestrels enjoyed a 6-point lead before the visitors found their rhythm, attacking the mid-range, with Dawson coming off the bench and scoring a quick 4-points. However, it was the Kestrels who looked the more convincing in the first quarter, led by 8-points from Velkey, pushing the hosts ahead, 19-12. In the second quarter, the Kestrels defence went into high-gear, protecting the paint and limiting the opposition’s attack to the mid-range and 3-point line. Despite an early 3-pointer from Rider’s Lauren Saa, the visitors struggled to find their range from the perimeter. The Kestrels too were not firing on full throttle, but some good phases of ball movement allowed the Kestrels to get contributions from their bench with Jerram, Karpova and Wöellenstein coming into the game and making solid contributions. The Riders were held to just 7-points in the quarter, whilst the Kestrels added a further 11-points, to go into the half, 31-19. In the second half the Riders defence went into overdrive, creating panic for the Kestrels offence, which until this point had looked patient and decisive. The Riders began to set the tempo which triggered their offensive production. Despite early back-to-back threes from Gomez, it was the Riders that went on a 6-point run to end the period, down by 14 at the end of the quarter. After making some adjustments in the break the Kestrels went to work at both ends of the floor. TSK’s offensive production was given a boost by Andrea Kurkowski, who scored eight of her game high 20-points in the early part of the quarter. With a lead as big as 25-points in the fourth, Kestrels had contributions from all 12 players. Despite a late run by the Riders, with Lauren France scoring all 11 of her points, the game was ultimately dominated by a gritty defensive performance and a balanced inside-out attack that prevented the Riders from establishing their trademark run n gun style play. Whilst the Kestrels got off the mark quickly with Geena Gomez scoring 8 of the Kestrels first 10-points, both teams traded baskets in the early going. Rebecca Brindley was not to be out-done and Kestrels struggled to keep a body on her, as she hit 8 of Team BIrmingham’s 10 first-quarter points. However, it was a balanced attack from Kestrels that dominated the play and led to them jumping out to a 10-point lead, finishing the quarter, 20-10. In the second quarter, the west midlands outfit made adjustments, and whilst Brindley continued to plague the Kestrels defence, big performances from Lucy Buxton and tough defence from Greenaway kept the hosts in the running. However, efforts to guard Gomez out of the game proved largely futile, as she scored another 12-points in the quarter. It was the Kestrel’s bench that proved the difference though with Kristina Karpova coming in to add 7-points of her own with notable contributions from Stevie Ellis at both ends of the floor. The half ended with Kestrels extending their lead by 2-points, 46-34. In the second half Team Birmingham refused to go away and battled to create problems for the Kestrels at both ends of the floor. Brindley created match-up problems for Kestrel’s defence, whilst offensively the Kestrels seemed to lose some of the focus and composure shown in the first half. A tight third quarter allowed Birmingham to stay within striking distance, even though the Kestrels held onto a 10-point lead. With 5-minutes left in the game, Solent made some costly unforced errors, which allowed Birmingham back into the game. With 1:21 left on the clock and a 6-point lead, Brindley made a deep three, reducing the deficit to just 3-points. Kestrels immediately turned over the ball, which led to a fast break lay-up by Greenaway. However, Jackson made a key jump-shot to settle the visiting team, followed by a couple of big free-throws by Andrea Kurkowski. Despite a last ditch attempt to stop the clock, Jackson was fouled in the act of shooting and made a final free-throw to close out the game for TSK, final score 81-76. Saturday 6th October saw the Team Solent Kestrels Women play host to Ipswich for their first home game of the season. Ipswich arrived with a depleted squad, after falling foul to a last- minute stomach bug. Whilst the Kestrels missed their starting small-forward, Krisztina Velkey, the return of Jodi Jerram was sure to provide some added depth to an already formidable roster. The game saw both unbeaten teams come out firing. Kestrels got off the mark quickly, attacking the Ipswich defence on the inside with Gomez, Jackson and Kurkowski putting the home team ahead by 4-points early (10-6). Ipswich, however, were quick to respond with game leader Harriet Welham taking her team on her back with 14 first-quarter points. Little and Taylor-Willis combined for a further 12-points to end the first quarter and take a commanding 9-point lead into the second quarter, 19-28. However, not to be outshone on their home court, the Kestrels rallied in the second and pressed home their own defensive effort. Whilst Welham continued to be a thorn in the Kestrels’ defence, Ipswich were held to just 11-points for the quarter. Kestrels forwards, Kurkowski and Jackson, proved too much for Ipswich on the inside, whilst Gomez and Jerram provided balance by attacking from mid-range and the perimeter. The Kestrels offensive barrage and defensive intensity turned the tables by the half, giving them a 5-point lead, 44-39. The crowd enjoyed another strong showing by both teams in the third, as the Kestrels and Ipswich exchanged punches with both starters and bench players making big plays. A variety of players contributed in the third, but Silvias Cante 100% shooting ensured that the Kestrels closed-out the quarter the stronger team, extending their advantage to 7-points, going into the 4th. However, it was Ipswich who took the initiative in the 4th. Whilst both teams attacked and pressured, it was Ipswich who would find some offensive rhythm down the stretch, outscoring the home team by 12-points and taking the win, 79-84. Saturday 22nd September saw the Team Solent Kestrels Women take to the road for the season opener against Sevenoaks Suns. Whilst Sevenoaks are new to the division, Coach Lee was keen to make-up for the loss faced against Sevenoaks in last year’s quarter-final of the Cup. US guard, Geena Gomez opened up her account with free-throws from the foul-line in a first quarter that would see both teams struggle to hit the mark. Whilst the Kestrels took the initiative to lead 12-15, a late 3-point bucket from Suns’ Hutchinson, tied the game at fifteen a piece to close the first quarter. In the second quarter, two of Kestrel’s newest signings, Gomez and Hungarian born, Krisztina Velkey, combined for 8-points, which saw Kestrels amass an 11-point lead. But it was the Suns who finished the quarter strongest, attacking the Kestrels’ defence at will. Sevenoaks’ Bennet scored 6 unanswered, allowing the Suns to swing the contest back in their favour, going into the half-time break, 32-29 up. During the break Coach Lee asked his players to play with more discipline at the offensive end and a greater sense of urgency at the defensive end. However, it was the Suns who came out firing, going up by 7, before Jackson, Karpova and Gomez combined to close the gap. Despite a solid run of play by the youthful Suns, Kestrels finished the quarter ahead by 2-pts, 44-46. The crowd, which included Kestrels’ own U14 girls who had travelled from their own game earlier that day, were treated to a thrilling final-quarter in which neither team could break the elastic. In the dying seconds of the game, a great defensive effort prevented the Suns from taking the lead, followed by a nice piece of skill by Gomez, which led to her going to the line. Gomez missed the first, but sinked the second to seal the game. On Saturday 15th September, St. Mary’s played host to the first game of the season for this year’s Division 1 Women in the form of a pre season match up. As preparations continue and new signings join established players, Team Solent Kestrels faced-off against Camden Panthers, a veteran team that normally plies its trade in the London league. Both teams started off tentatively in the first quarter, with the Kestrels stuttering to a 1-point deficit in the first, 9-10. In the second quarter Kestrels new American guard Geena Gomez, a former starter at San Diego State, showed her class early getting the Kestrels into the game with a couple of early buckets, before Andrea Kurkowski started to connect from close range. Nevertheless, it was the Panthers who dictated the tempo, led by guard Yamaguchi, who would eventually claim a game-high, 18-points. The Kestrels regrouped at half-time and entered the third with a renewed sense of intensity on the defensive end, holding the Panthers to just 11-points. It was Estonian newcomer, Kristina Karpova who got hot from the perimeter in the third and dropped 13-points in the second-half. The Panthers kept up their assault in the fourth with balanced scoring from their starters and the bench. However, with big time-outs for both teams in the closing minutes, it was the Kestrels that closed out the game for a 3-point win, 60-57. Kristina Karpova and Geena Gomez top scored for the Kestrels with 13-points a piece. Yamaguchi led all scorers with 18-points, with the Panthers’ Ascorreta and Lepanen contributing 9-points each.